You’re over forty and exercising regularly. You eat a balanced diet and skip on dessert at parties. And still, you can’t get rid of those extra pounds. Sound familiar?? If this scenario describes you, you’re just not imagining things. Often, losing weight gets harder as you get older, even if you’ve always been able to easily manage your weight with diet and exercise. Here are seven ways to lose that extra weight after 40. Before you try anything else, make sure there isn’t an underlying factor interfering with your weight loss, like a thyroid hormone dysfunction. Did you know that nearly 1 in 5 adults over 40 suffer from thyroid problems that can interfere with weight loss? Your thyroid is the main regulator of your body’s metabolism, so having an over or under-active thyroid gland (hyper or hypothyroidism) can truly interfere with weight loss. Hormone imbalance can wreak havoc on your weight. Keep in mind that perimenopause and other hormone changes can start when you are in your 40s. Estrogen dominance will definitely interrupt weight loss but so will the imbalance of cortisol, leptin and insulin. Thyrosmart from Lorna Vanderhaeghe is an excellent, natural supplement that helps try to manage the symptoms of thyroid disease while promoting thyroid health. You may have heard it said, that the more muscle you have on your body, the better your metabolism works. Having more muscle increases your resting metabolic rate (RMR). This helps you burn more calories at rest—which is what you want if you’re aiming for weight loss after 40. 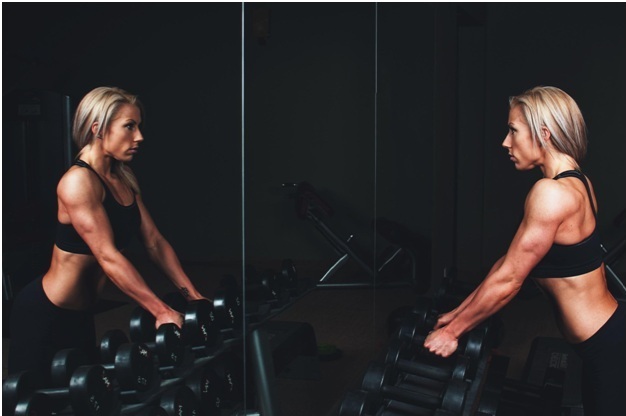 So if you’ve been avoiding those weight machines or dumbbells, now’s the time to dedicate yourself to strength training. It is never too late to start strength training! If it is new to you, take advantage of any free personal training sessions that might be offered when you join a local gym or health club. Fat in the midsection (belly fat) is metabolically active and we gain more of it as we age. That’s not a good thing. As opposed to the fat we gain in our thighs and rear, abdominal fat can lead to several chronic conditions. Studies have found that the type of fat we consume might make all the difference. Participants in the study were asked to eat 750 extra calories every day for seven weeks. Those having excess calories from saturated fats had activated cells that promote fat storage in the belly and increased insulin resistance. However, individuals who had a high consumption of polyunsaturated fats found in fatty fish, nuts and seeds, gained less abdominal fat and were more likely to increase muscle mass instead. Eating well isn’t just about skipping out on processed junk food. It’s also about filling up your plate with clean, healthy foods that can actually assist in your weight loss. Healthy fats like those found in olive oil, avocados and nut butters nourish your body while helping you feel full longer—which means you’re less likely to overeat. A study from the Canadian Medical Association Journal found that healthy habits, like eating fruits and vegetables daily, significantly improve the odds of successful aging. Plants provide a protective measure against oxidative stress and free radical formation — two things that go hand-in-hand and increase with age. The more years we live, the higher our risk of developing a disease, especially heart disease, cancer, stroke and diabetes. All of these conditions are tied, in some way, to inflammation. A 2017 study from Georgetown showed that mindfulness meditation had a significant impact on reducing stress hormones and inflammatory proteins and a 2014 study found that just 25 minutes of meditation a day could alleviate stress levels. If you don’t have 25 minutes to spare each day, a 5-minute meditation helps. Or 1-minute meditations can calm your mind. It’s that easy. While quality zzz’s can become ever-elusive as you age from busy schedules, back pain, or menopausal symptoms like hot flashes or insomnia, getting enough sleep is an essential component to weight loss. A good night’s sleep actually burns calories! Plus, studies have shown a strong link between lack of sleep and overeating the following day. This is because the hormones ghrelin and leptin are thrown out of whack when you don’t get enough sleep, leaving you feeling more hungry but less satiated at every meal, which leads to overeating.